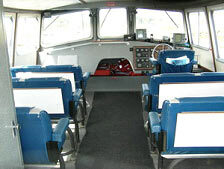 This vessel is a Transport Canada certified 12 passenger, 36 foot high speed catamaran commercial water taxi and is operated by qualified crewpersons. 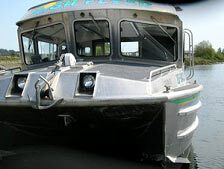 It would be our intention to provide this vessel and operator to your organization with the thought in mind of extending the range of the tours you are presently offering your client groups. We are in no way entering into the Sea Kayak/Eco-Touring business. We are only proposing an adjunct service to your existing operations/organization. 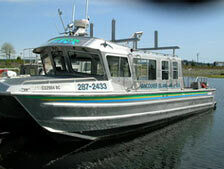 This high-speed vessel is capable of running passengers from the Vancouver side to the Islands or around the Islands as required. With 12 passengers, gear and kayaks we are capable of cruising speeds in the 28 to 30 knot range, dependent on sea conditions. The proposed range of operation would be from Race Rocks off Victoria to Desolation Sound. Our preferred areas of operations are the Southern Straits, Gulf Islands, Sunshine Coast, Howe Sound, Indian Arm and Fraser River. In past years we had dropped kayaks off near Nanaimo and picked them up several days later down South near Victoria and returned them to a base of operations. The above tour could also operate from the Southern locations to the Nanaimo area and then back to your home base. If this unique opportunity interests you in any way, please contact us to facilitate further discussions.